Wire bound documents for use as manuals, books, booklets & presentations. Printed digitally with great prices and rapid service for whatever quantity you need. If you have a very large quantity, i.e. in the thousands, it's worth asking the helpdesk for an alternative litho printed quotation. We can do custom sizes where technically possible, but these will cost more. Please have a chat with the helpdesk on 01452 751900 to discuss. Spirals and wires are pretty flexible, so for most sizes you can have the long edge or the short edge bound. The exception is A3, where you can only have the short edge bound. Combs are more limited, you can only have A4 size and only the long edge bound. For most documents, when you specify long or short edge it's pretty obvious which one you want us to bind. For instance a portrait orientation document with long edge binding will be bound on the left. A landscape orientation document with long edge binding will be bound at the top. However, it's a really good idea to let us know via the "order notes" which edge you want bound! There are other colours that we can special order in for you. Contact the helpdesk if you'd like a special colour. These do cost a little extra, especially if you only want a small quantity bound and they will add a few days to the lead time. Clear PVC covers, also known as "acetate" covers can be applied to the front, rear or both front and rear. You can have them instead of card covers, or as well as. A typical use for these covers is at the front of a report. The report is then printed on normal paper and an embossed heavy card back applied. We use sturdy 240 micron covers as standard, but can special order thinner material if required. If you need thinner clear PVC covers, please call the helpdesk on 01452 751900. Clear PVC covers AND thick frosted (polypropylene) covers are not normally used at the same time. However, you can order this combination if you wish, there is no technical reason why not. 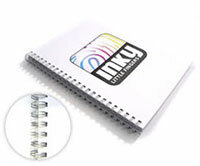 Thick frosted covers are high quality covers with a textured and opaque finish. They are suitable for the fronts and / or backs of documents. Our standard covers are 500 microns (0.5mm) thick. We can special order 800 micron thick covers but this will add a little extra cost and lead time to your order. If you need this option please call the helpdesk on 01452 751900 to discuss. Card covers are the most popular option for spiral bound books. These are white card. Once you select this option, you will be able to choose exactly what you need. For instance: you may want 350gsm card covers front and back, with the front cover printed on the outside, blank on the inside, the rear cover blank and both sides of both covers laminated with a matt laminate. That's just an example, you can choose exactly what you want. You can also mix and match card covers with other options. For example, a printed front card cover and a traditional embossed black rear cover. We've been producing these for many years and try to allow you to select exactly what you need for any given project. 300gsm matt card. A smooth white uncoated board. 300gsm matt recycled card. A white uncoated recycled board made from 100% Post Consumer Waste. 300 or 350gsm silk card. A coated board, fairly matt and very smooth with a slight sheen. 300 or 350gsm gloss card. A coated board, very smooth. If you are not familiar with commercial printing paper, you should note that this is not a high gloss, like a photographic paper for a desktop inkjet printer. It's more of a dull or semi gloss. You are welcome to samples. Please call the helpdesk on 01452 751900 to discuss. There is little or no image quality difference between any of the non-recycled paper types. There is a slight reduction in image quality with the recycled paper. We're sometimes asked about whether you can write easily on these papers. You can write easily on all types with a standard ball point pen. If you want to be able to write with a fountain pen, then we recommend sticking to the matt paper. You can request a lighter weight card for your cover, but this is unlikely to be cheaper, unless the order is relatively large. Embossed back covers are not normally mixed with any other type of back cover, however you can order this with other cover options if you wish. We can special order some other colours and embossing patterns but this will add a little extra cost and lead time to your order. To discuss this option please call the helpdesk on 01452 751900. All colour and mixed printing is done on a high quality digital colour press. All B&W standard quality printing is done on a high speed production B&W printer at 2400x2400dpi. The standard B&W quality is also excellent, giving crisp text and graphics and photographs at 150lpi. If you have any blank pages, for example before the start of a chapter, you must count the blank page as a black&white page. Nearly all of the time, you'll want both sides of the inner sheets of paper (leaves in the document) printed. That's the way documents normally are, so that's the default! If you want a blank page anywhere, well just go right ahead and insert a blank page where you want it and count it as one B&W page in your page count. Once in a while a customer wants single sided printing and that's where this handy dandy option comes in. Choose SINGLE sided printing and ALL of your leaves will be printed on the FRONT and left blank on the back. If you select SINGLE sided printing, there's no need to insert blank pages (except if you want a blank FRONT as well as a blank back). The number of B&W pages in your document. This is pages, not sheets. For example: a book with 100 sheets of paper inside (leaves) is a 200 page book. The number of colour pages in your document. You can choose from a wide variety of paper for your inner pages. Matt paper. A smooth white uncoated paper. Quite a bright white. Matt recycled paper. A white uncoated recycled paper made from 100% Post Consumer Waste. Silk paper. A coated paper, fairly matt and very smooth with a slight sheen. Gloss paper. A coated paper, very smooth. If you are not familiar with commercial printing paper, you should note that this is not a high gloss, like a photographic paper for a desktop inkjet printer. It's more of a dull or semi gloss. You can't mix and match the paper within the document as standard. If this is something that you would like to do, please call the helpdesk on 01452 751900. Be aware that this will add some cost to your job. The recycled paper is not the same paper as the off white recycled paper that is an option with softback or hardback book printing. If you want that as an option, please call the helpdesk on 01452 751900 to discuss. white tab dividers in either 5 tab sets or 10 part sets. rainbow colours tab dividers in 5 part sets. white dividers with plastic reinforced tabs in either 5 tab sets or 10 part sets. We print in black and white on the tabs inclusive in the price. You need to give us the tab text separately. If you need a different option, please call the helpdesk on 01452 751900 for a chat. PDF (online soft proof). This is a technical process to check that your artwork is printable and to prepare it for printing as far as possible. We aim to provide your soft proof within 4 working hours and you will get an email notification that it is ready. The PDF that you submit has a pre-flight check carried out and a number of automatic corrections may also be made if necessary. The resulting soft proof is a PDF that is viewable through your admin area of the web site. It is very important that you carefully review your soft proof and the pre-flight report that we send to you. Your first soft proof is included in the price of your order, but if you find that you need to make alterations and resubmit your artwork, we will charge £5.00 for each additional soft proof. Please contact the helpdesk to arrange payment if you need additional proofs. These are working days to print. Our standard print service is 4 working days to print. You can pay a slight premium if you want your order on the faster 2 day to print service and a little less if you can wait for 7 working days before it's printed. Certainly! Please call the helpdesk on 01452 751900. Our samples are Inky branded, we don't print samples free of charge from your artwork. Please take a look at our Books & Manuals General Information page. That describes the different types, with photos and what they are primarily used for. This product page is for digitally printed products. We use the latest generation digital presses to produce excellent products and you are welcome to request a sample by calling the helpdesk. If you require very large quantities, we also print in house using lithographic technology and this can be cheaper for very large quantities. Please call the helpdesk for a chat if this sounds like an option that you would like to discuss. You need to send us a PDF, but please read the artwork preparation guide (link on the right hand side towards the top of this page) for full details. For an overview of the order process, click on the "help getting started" link below the big blue question mark button. Once you've placed your order and we've received your artwork, we'll give it a basic check over. If there's a major problem, for example it's in the wrong format, or we need to crop it to make it fit, then we'll contact you and discuss how we can fix the problem. Otherwise your order will be scheduled to print as soon as it's paid for. Just call or email the helpdesk for a chat. How do I find out what all the options mean? I'd like to talk to someone about this, what number do I dial? Can I get a sample? Can you explain the different types of binding? What kind of printing is this? What format can I send my artwork to you in? How do I place my order? I want something that's not on this page, can you help? My question wasn't answered in these FAQs, what should I do?